Imagine the challenge many of our patients face trying to arrange something nice for their loved ones on the holidays. 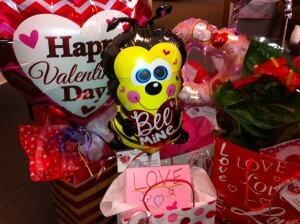 Running out to the store to pick up a box of candy or a dozen roses is not possible for many of our patients. The young volunteers of our Kids Who Care program recognized this need and responded by creating their own “Cupid Delivery Service.” Thanks to the Kids Who Care, patients in Olympia Fields can share their love on Valentine’s Day by selecting a gift of chocolates, fresh flowers or a handwritten card for their special valentine. The kids will handle the shopping and the wrapping, and will make sure they get to the patients’ clinical team for delivery. Special Delivery indeed – thanks Kids Who Care!